Samsung Galaxy S10E, S10 and S10+ leaked – triple rear cameras and double selfie cameras confirmed? 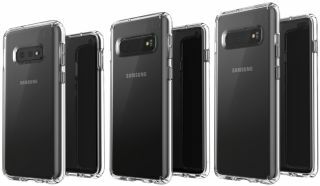 The Samsung Galaxy S10 has been leaked in spectacular fashion ahead of its official reveal, with a new image depicting three models: the Samsung Galaxy S10E, S10 and S10+. UPDATE: It's official, the Samsung Galaxy S10 has launched. You can read all about it in our Hands on: Samsung Galaxy S10 camera review. The image comes courtesy of leaker Evan Blass. While nothing is official until the phone is unveiled at Samsung's Unpacked event on 20 February, Blass has carved a reputation for leaking reliable information. In addition to the base Samsung Galaxy S10 model, the Galaxy S10E looks to be an economy variant while the Galaxy S10+ is set to be both larger and more expensive. The standard S10 reportedly measures 5.8 inches, while the S10+ stands at 6.4 inches. All three phones appear to have edge-to-edge screens, with a 'holepunch' design for the front camera rather than the 'notch' that has become the norm recently. The S10+ looks like it boasts dual front cameras – potential applications includes depth of field control, stereoscopic imaging and wide-angle options. Despite an Engadget report that Samsung would release a model featuring four rear cameras (the "Beyond X", measuring 6.7 inches), the S10E seems to have two while the S10 and S10+ have three apiece.